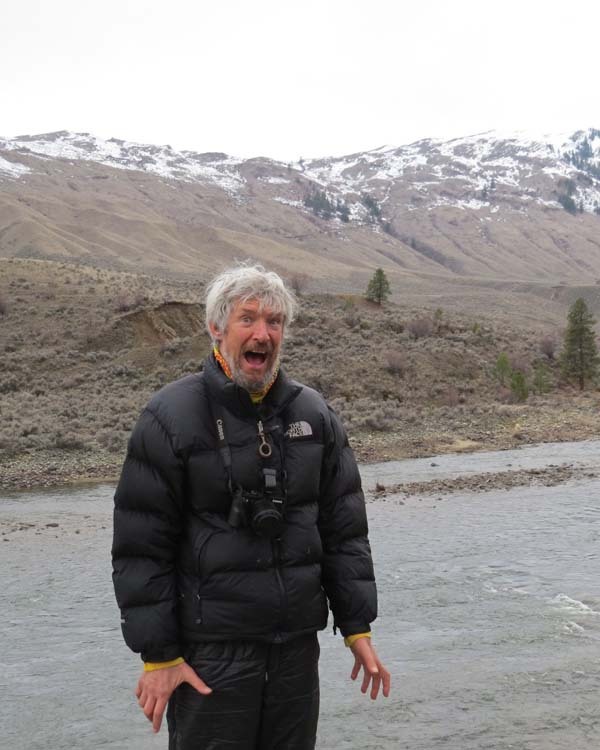 In contrast to the “We mess with Texas” trip, no sunscreen was needed on our recent four-day expedition to the Okanogan. After an early start we were going great guns picking up birds on I-90 on Friday morning. A Great Horned Owl was perched in daylight near Ellensburg and we had 30 species of birds by the time we met up with the rest of the group at Soap Lake. 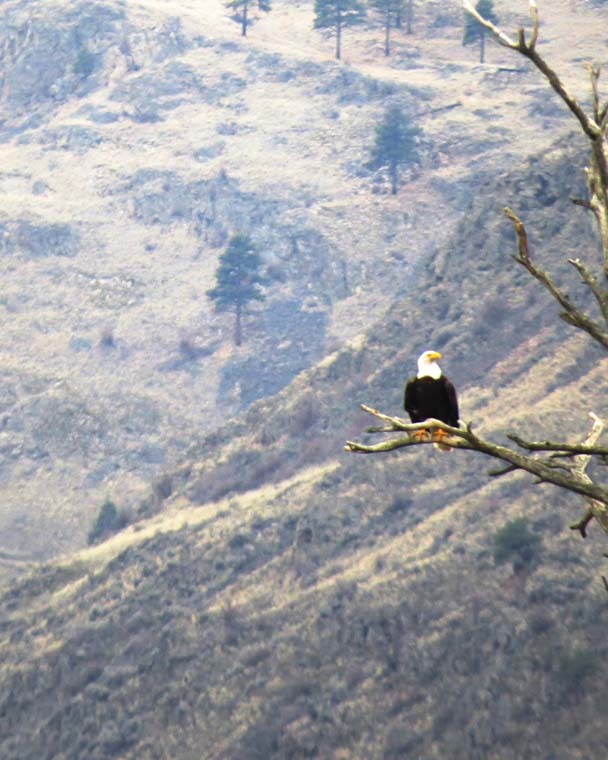 The trip was organized by the Yakima Audubon Society under the deft and fearless leadership of Denny Granstrand of Yakima. Then we hit the fog. 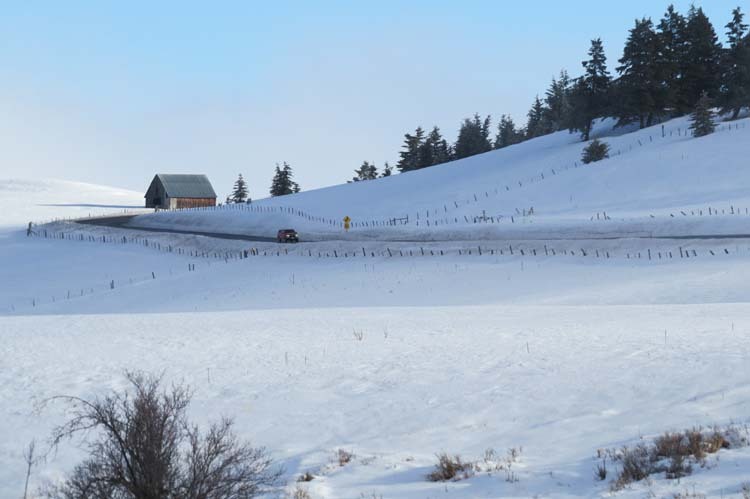 We were hoping for Snow Buntings, Snowy Owl and maybe a Gyrfalcon on the Waterville Plateau. 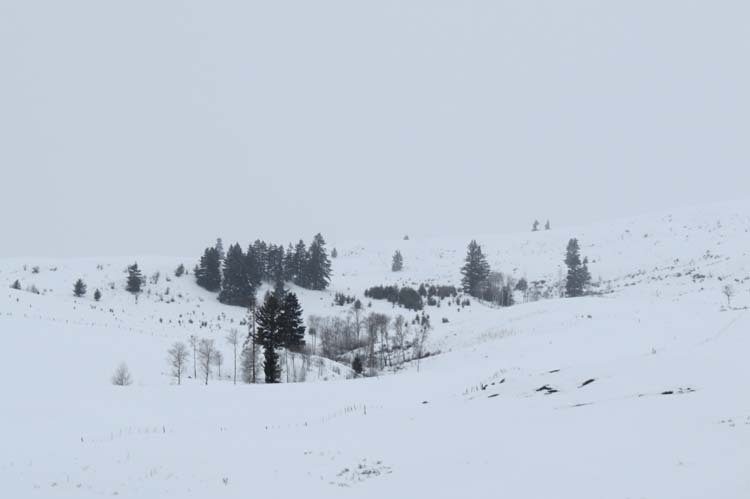 What we saw instead was a soupy thick white-out caused by dense fog that made driving surreal. The weather seemed quite cold to our delicate Seattle sensibilities, but actually I think we were in a warm spell—it’s the Brave New World I’m sure. 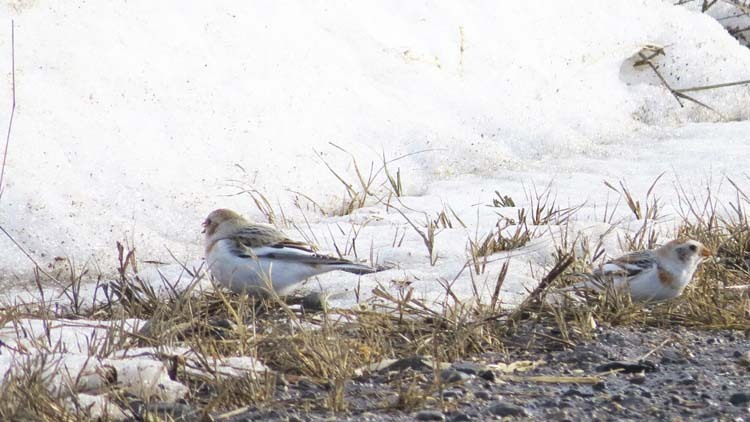 This shot of a couple of gorgeous Snow Buntings we didn’t see on the Plateau was taken several days later in Okanagan County. 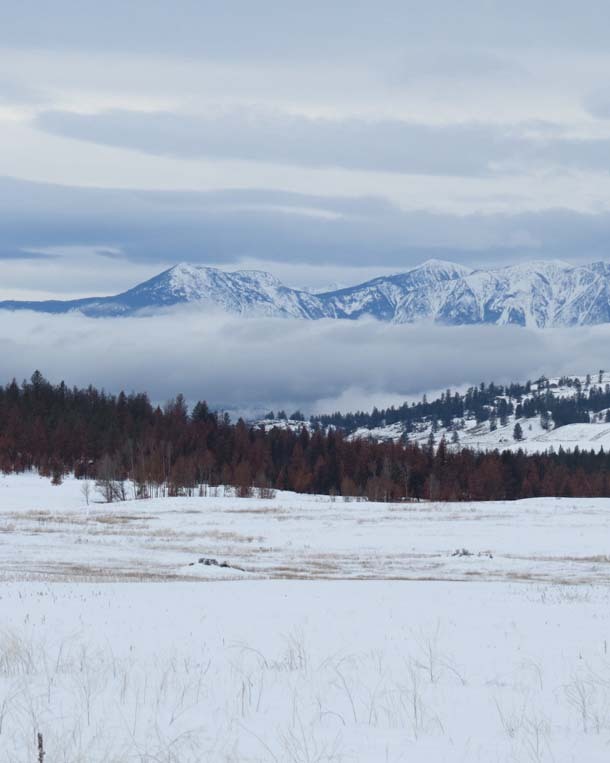 Next morning we went up to Havila from Omak to look for what became our great nemesis bird of the trip, the Great Gray Owl. We again encountered lots of fog. 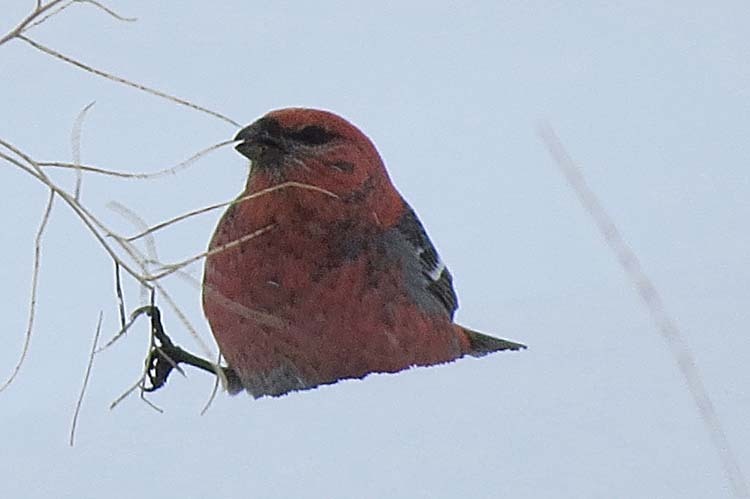 As it began to lift I shot this Red Crossbill through a dissipating fog soup. We had lots of luck encountering the Great Gray Owl’s small cousins. 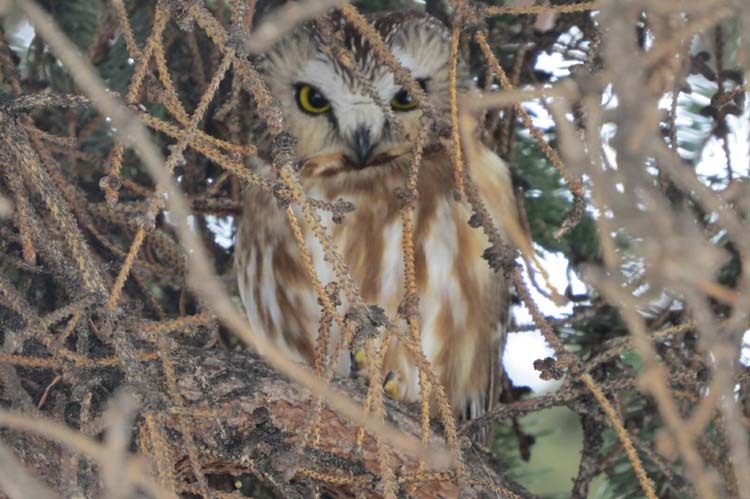 This is a Saw-whet Owl in Bridgeport. We found about five. 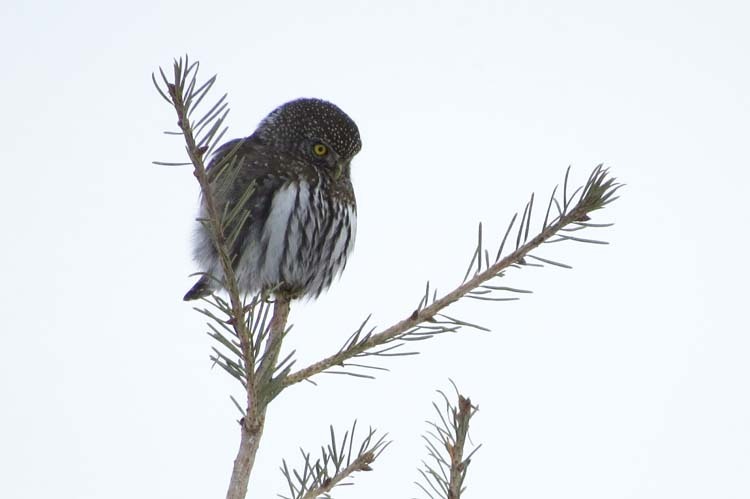 And this is one of at least five Northern Pygmy Owls we encountered during the trip. At dusk Lamont, one of the our group, spotted a big owl on a power pole near Havila and we had for me the rare experience of being disappointed to see “just “ a Great Horned Owl. 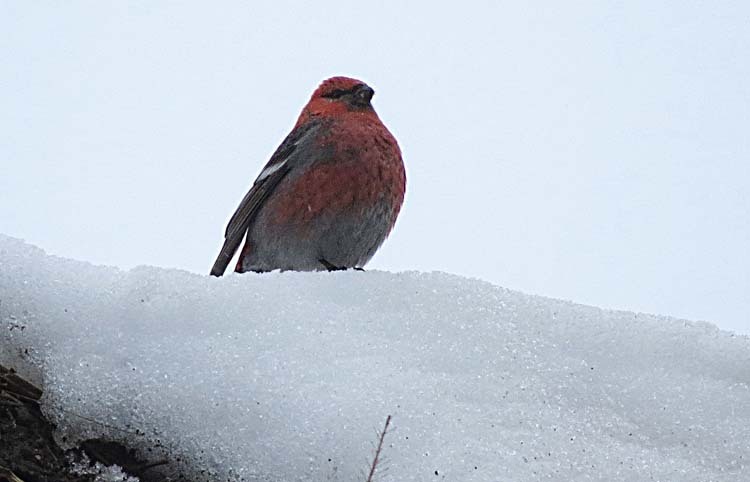 Lamont, who will get free admission on the next trip—Oh wait a minute, everybody got free admission, Yakima Audubon hasn’t caught up with the real world!—spotted a group of Pine Grosbeaks by the side of the road. Here’s a male posing . And here he’s at work getting lunch. 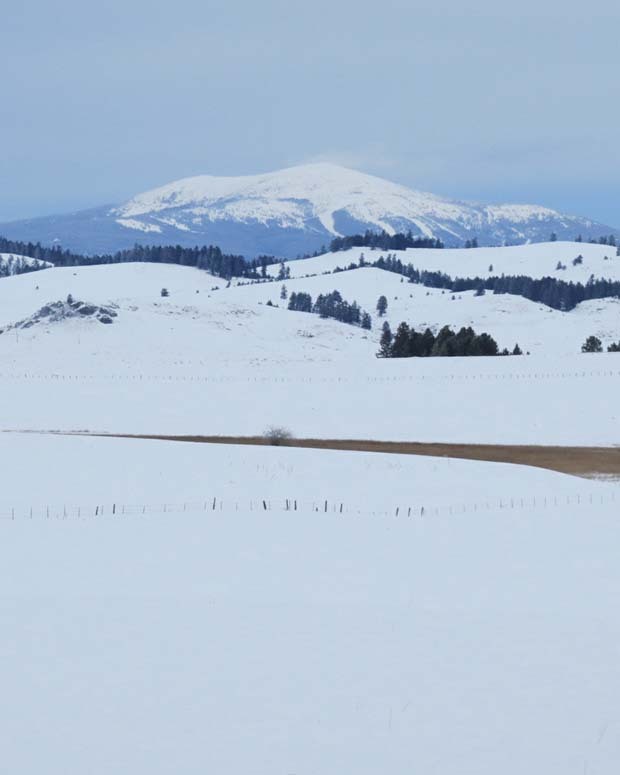 Coming off the Waterville Plateau we had stopped above Bridgeport and other birders pointed out these distant Sharp-tailed Grouse, above us on the hill. I apologize for my photos of these sage-specialist birds which used to be so abundant the DAILY bag limit was set at 20. 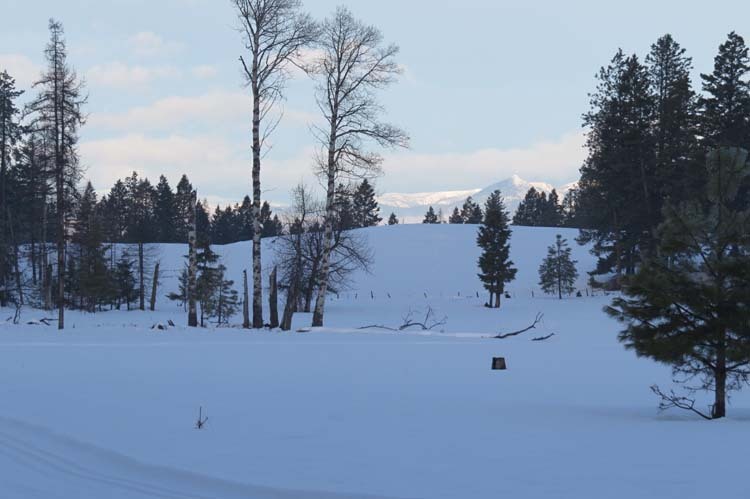 Here’s the ski slope near Havila. This is Mt. Abercrombie, in Canada. At one point, I reached under a barbed wire fence and made a snowball out of Canadian snow, but don’t worry, it won’t happen again, we’re building a wall. 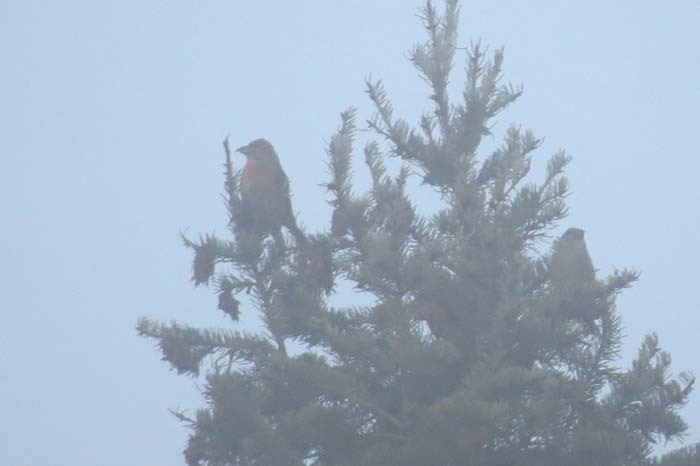 We found these Redpolls in Chesaw. 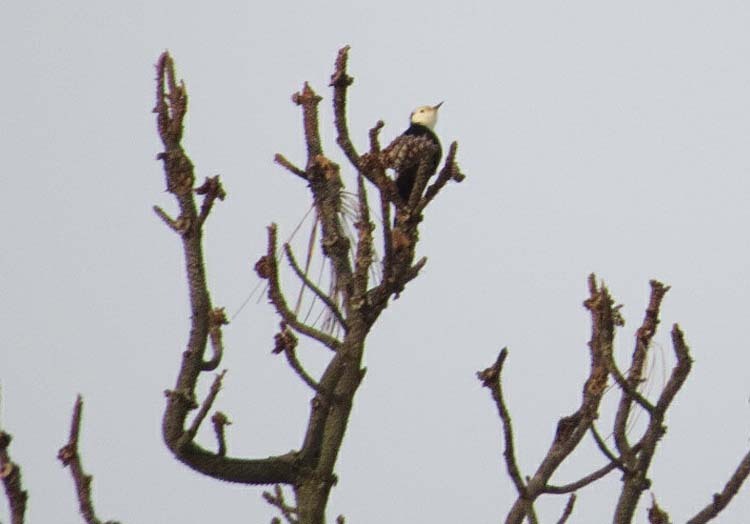 In my binoculars, the red forehead spots gleamed brightly, and I held out great hopes for this photo. It was the one that got away. Maybe I’ll have to paint the scene and combine the photo with the vivid memory. 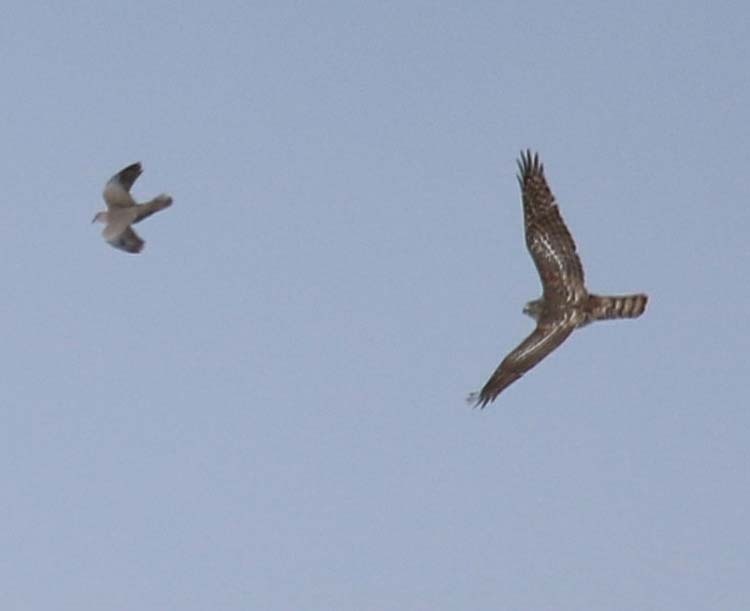 A large juvenile Goshawk attacked a Eurasian Collared Dove and chased it to within an inch of it’s life, then gave up and flew off like a bullet. I was frozen in confusion and amazement and never reached for my camera so I asked Lamont McLachlan for permission to run his shots, this one showing the two birds in chase. More than any other shot of a Goshawk I’ve seen, this seems to show the long-wingedness of the species compared to Cooper’s or Sharp-shinned, the cousins. 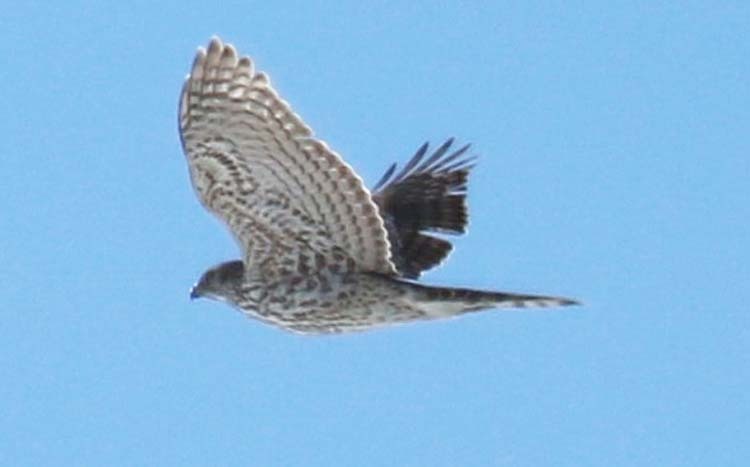 And here is his shot of the Goshawk heading to the south at high speed. Great landscapes were everywhere. Here’s one. Aspens contribute to the beautiful thing that the Okanagan has going. Horned Larks were common in the wide open areas. Only one “horn” shows here. What a cool bird. We had Pygmy Nuthatches and this female White-headed Woodpecker in a lower-elevation Pine Forest. 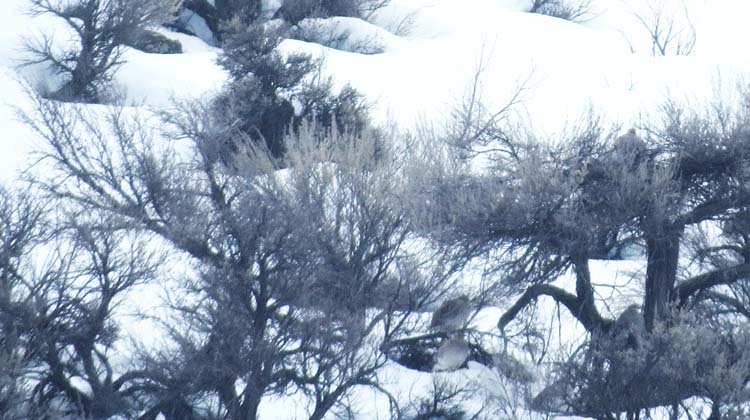 This female Bald Eagle (Gender ID can be achieved by looking for the “Roman Nose” of the larger female) was in the Canyon. We also had more than a few Golden Eagles. Birding can be great fun, but as this shot taken in the Canyon shows, it’s important to be careful at all times. This is Brian Pendleton moments after I warned him not to stand so close to a sheer drop off. 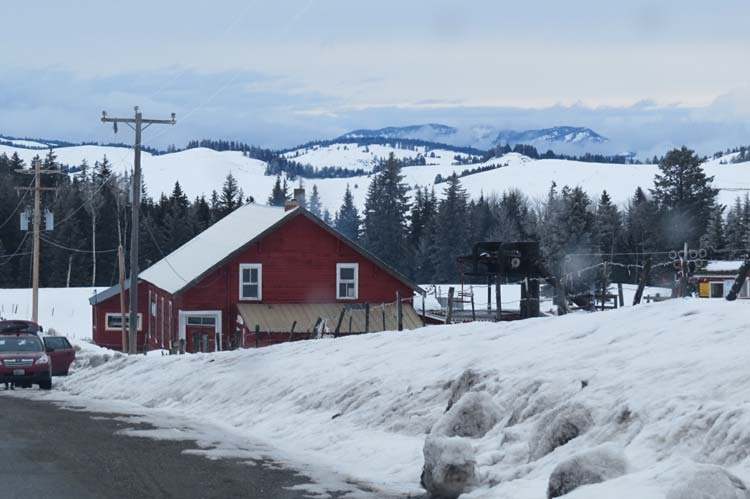 On the last day we tried the Waterville Plateau again. 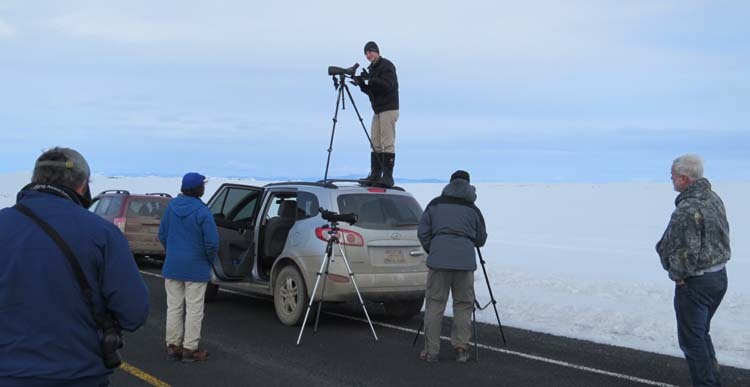 We looked hard for a Gyrfalcon that had been reported by another group. In an effort to find the bird, this group from our party made the first ascent of “Mt. Gyrmore” but to no avail. Here’s Delia, Lamont and Brian looking for distant raptors. There was a distant teardropped-shaped object seen. Tear-dropped is a good sign of Gyrfalcon. 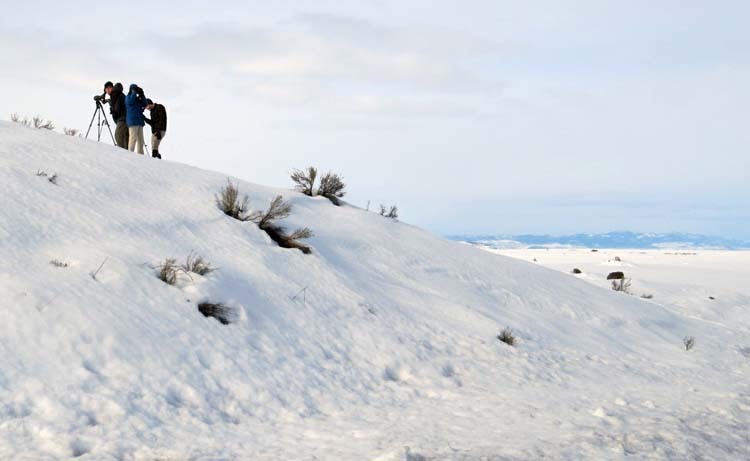 Eric Heisey took matters into his own hands to get a better look but in the end decided it was most likely a tear-dropped-shaped rock. Eric is a senior in High School who knows way more about birds and is far better in the field than well, let’s take me for example, despite my having a 50-year head-start. We were lucky to have so much expertise. 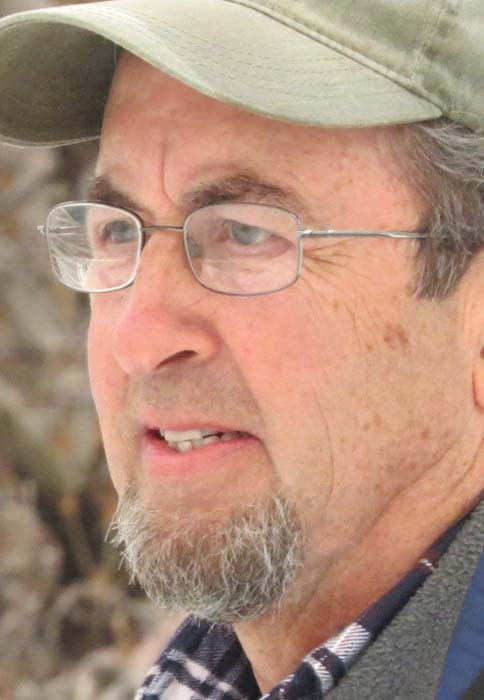 Andy Stepniewski, author of Birds of Yakima County and also an expert on Okanagan County was along and he brought his wide background of knowledge including botany and geology that made things interesting when the birds were scarce. 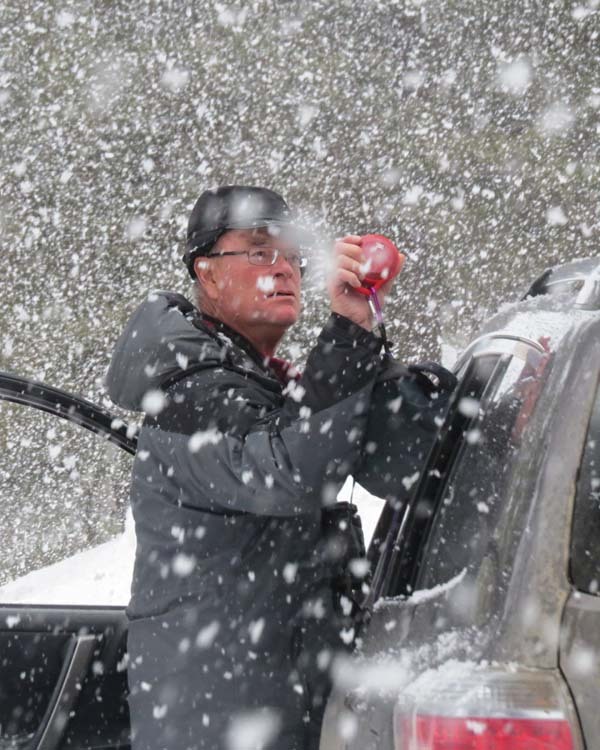 Here he is in our one snow storm. If you hear of a trip being led by Denny Granstrand, book it immediately. 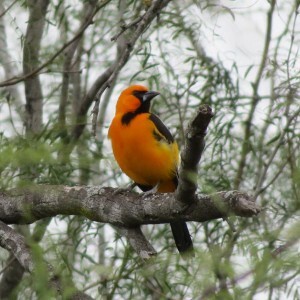 He’s an expert on birds, a great photographer and will through in enough well-timed jokes to keep everybody laughing. 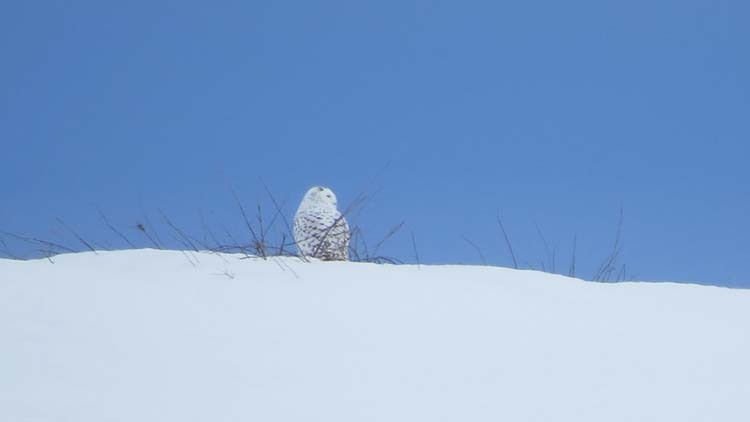 Brian finally found this Snowy Owl on the Waterville Plateau. We looked some more for a Gyrfalcon but then decided to head over the pass before it got too late. 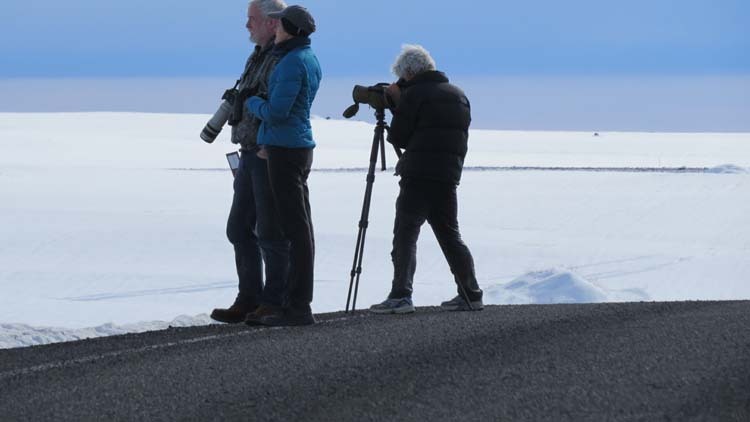 We’d seen 89 species of birds and a Porcupine, made great friends, learned a lot and had many good laughs. It was a golden weekend, even if partially obscured by fog.